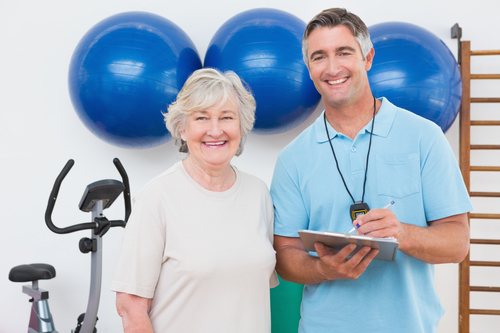 There are several valuable things for older adults that can be achieved through physical therapy. Many of us know that physical therapy can help alleviate pain and recover from injury, or help with chronic conditions like arthritis. But physical therapy is also very effective in helping people prevent injuries and chronic conditions, by remaining fit and strong and flexible as they age. Much of age-related disability can be avoided or managed with physical therapy. It is wise to keep in mind that even ordinary physical changes that come along with aging may be delayed, prevented or reversed with physical therapy. Preventing falls is one of the important things physical therapy exercises can help seniors with. Balance problems are one of the biggest causes of falls for seniors, and physical therapy has very effective ways to address balance issues. Physical therapy can also help seniors with stroke recovery, help them cope with the physical effects of chronic diseases such as diabetes, and manage or alleviate pain. Physical therapy could be a great option for you or a senior loved one. Whether you have an active lifestyle, or are more sedentary, a physical therapist can create an exercise plan that addresses your specific problems. At Harmony Senior Homes we are dedicated to supporting the highest quality of life for our residents. Maintaining health and strength is essential to living the good life.